Several years ago I remember my youngest son had just gotten his first (key word here, he was lucky enough to have them twice!) set of braces off. He had just started the fourth grade and at lunchtime he took his retainer out and wrapped it in a napkin. Well you know how the story goes here...needless to say, he threw his brand new retainer in the garbage at the cafeteria. When he got home he told me about it and we went back to school to see if we could find it. The staff was very helpful and suggested that we try to look through the garbage for it. The garbage had been taken out to the dumpster. The custodian was kind enough to show us where it was located. We took one look at that slimy, smelly thing and we were out of there! You couldn't pay us enough to do that! 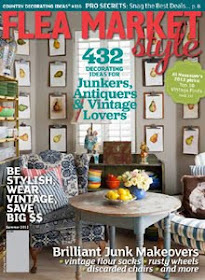 Recently I have been on the hunt for some stools to pair with a funky old mail room worktable I found. The table is bar height and my sister (FJS#4) suggested I use it as an outdoor bar. I haven't had any luck at garage sales or CL in finding any. I even checked the local retailers to see how much they would cost new. $39 each was too rich for my frugal blood. I was trying to be patient so I tabled the project for awhile. Until last night.... my husband and I were walking late in the evening and we noticed a dumpster by the mailboxes. Something made of wood was sticking out of the top. When we got closer these are what we found! Perfect height and all! 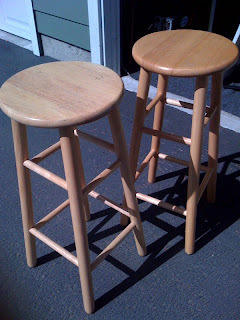 Soon these stools will be helping us entertain our friends....stay tuned....I have plans for them, it has something to do with Margaritaville! 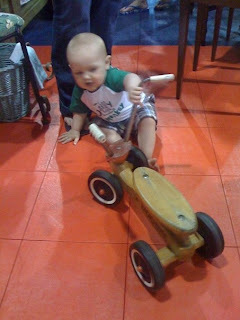 Last weekend we pulled out the beach cruisers and rode them down to Meeker Days Festival in Puyallup. We stopped and listened to the bands playing and we followed the wonderful aroma to the food area. We watched a vendor make the most scrumptious looking artichoke chicken crepes. It looked so yummy! We saw so many people we knew as we walked around the park. Our last stop was a visit to DeCaterina's Restaurant. This place is a favorite of ours, it has such a cool vibe. The atmosphere is incredible, from the circular bar to the outdoor seating. You must check it out sometime, make sure you say hello to Peter, the owner. 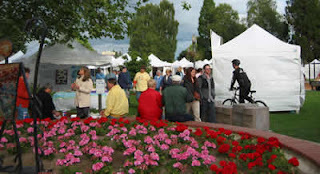 Many communities around the Puget Sound area are celebrating summer. Search the internet for one near you....the weather is cooperating so get out and enjoy it! Every year in July my husband's family does a big BBQ cookoff. We plan for it for months. The rules consist of this: You must enter a main dish, a side dish and a dessert. 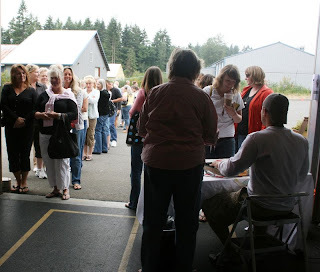 You must provide enough for everyone to sample (this can be hard since we have over 100 people that attend). 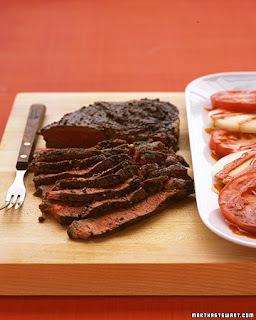 All of the dishes must be made on the BBQ or have something cooked on the BBQ for it. We do have judges, they are usually friends that like to eat. Oh, and there is a people's choice award for the crowd to pick. Most of the family breaks off into teams for the competition. The first cookoff started off mild with about 6 contestants, the next year it got serious! Now it seems that all entrants pick a theme. One team had a bayou theme, my sis in law decided she would try to bribe the judges with her "Swamp Water" (which was really a margarita, cheater!) she served it up in old canning jars. 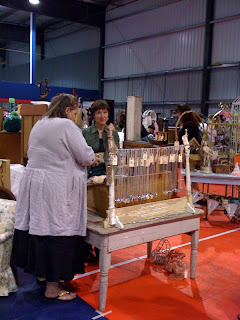 Her tables were covered with vintage cloths and she had fresh flowers on her serving table. My husband comes from a family of five boys, (it's a wonder his mother survived) the youngest brother is pretty clever. He came up with a Beach theme. Somewhere he found a 20 foot long, 8 foot high banner of a tropical beach scene for a backdrop, a tiki bar complete with torches to serve his food and beach balls strewn everywhere. It really was wonderful. He served fish tacos and won the main dish catagory. My sister Dixie and her hubby created an old saloon out of a tent. She bought the saloon bottle backdrop from Party City and put it up all around the tent. They had a bar to pull a stool up to, dressed up like cowboys and they served steak for their main dish. All of this happens in the middle of 30 acres with a creek and a pond. We camp out on a big grassy area all weekend and have a blast! We have so much fun that even the kids away at college make it a point to be home on that weekend. I guess it's kind of a big family reunion with loads of food and plenty of stories to tell afterwards. What in the world can I come up with this year to top all of this? 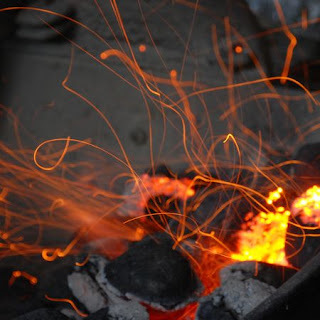 My husband is a master with the BBQ so I don't worry about that part so much....it is the darn theme thing that gets me. I WANT TO WIN! It is so nice to know that readers get a kick out of our funky junky lives. We just try to pass along our antics to all of you. The quirky things we create or do seem so trivial to us. But if you like to read it, we'll keep writin it! Thanks to Vicky for the award! 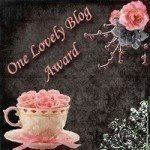 Now, we pass it along to all of the blogs on our blogroll. They inspire us and we hope they do the same for you! 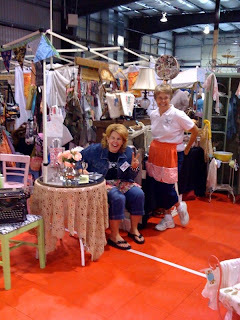 Don't be shy leave us a comment, we like to hear from all of you junkin queens, it keeps us goin! 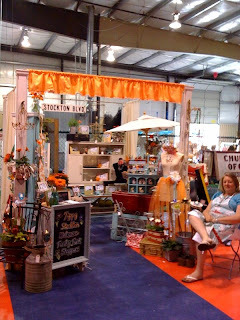 Do you remember the screen door we used in our booth at The Funky Junk Sisters Show? Well I am now using it as a trellis in my garden. Isn't it cute? You can't see it well, but I used chalkboard paint in the panels of the door and I wrote "My Secret Garden" on it with chalk. The screen panel is now chicken wire painted red. I have red clothes pins clipped to it to help secure tall plants. 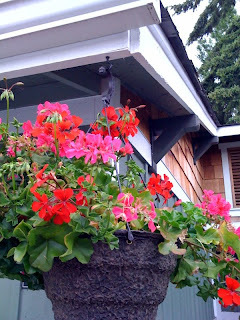 This red and pink geranium combo looks good together. More fabulous color. We just need the sun to come out again to give our flowers a boost! Thanks to all FATHERS for all that they do! 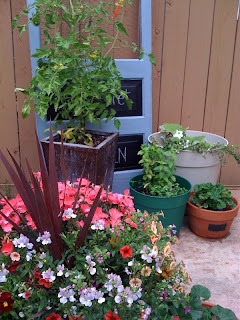 This was a great idea for some old pots (and an old bench). First we painted the seat of the bench a cream color, we left the legs natural because we were too lazy to paint them. 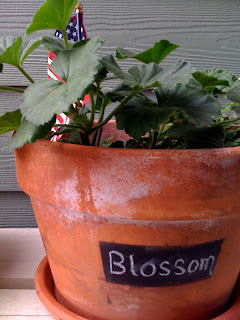 The terracotta pots were rescued from a junk pile, we just painted a rectangle on them with chalkboard paint. You choose what you want to write in the box, keep it short and simple. 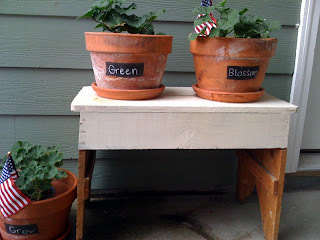 You could use this same idea with old buckets or old flower boxes.... chalkboard paint is our new best friend. 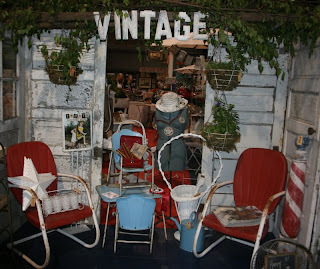 Have a great weekend, hope you find lots of junkin jewels! 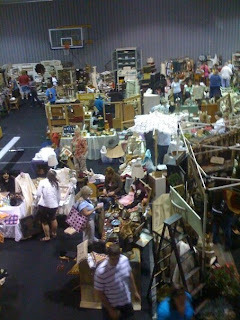 We have been so overjoyed by the positive response to our first ever Funky Junk Sisters Antique Show and Flea Market. 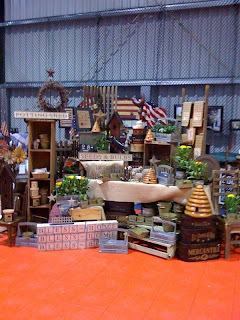 Our wonderful vendors worked so hard on their offerings and their displays were fabulous. All of the hard work really paid off, this show had some of the most creative displays we have ever seen. We love that many of you made a point to meet friends, family and other bloggers at the show to make a day of it and do some treasure hunting. Through the wonderful world of blogging you are sharing your stories... here are more links (don't forget to check the links on a couple posts back too). Well here we go, the winner of our first giveaway is Just Me Boutique! 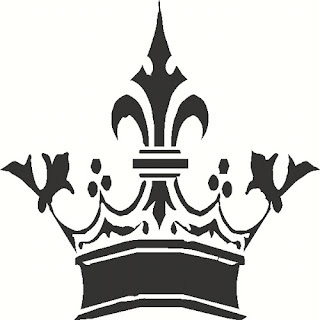 You are officially crowned a junk queen! 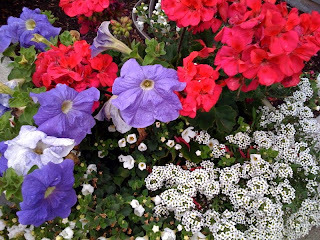 Just Me has a darling blog and she creates wonderful things, make sure you stop by! 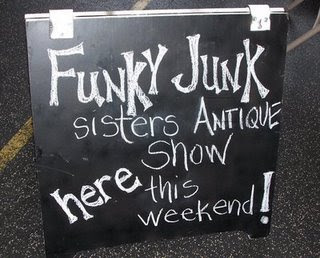 The Funky Junk Sisters 1st Annual Show a Success! SO MUCH FUN!!! SO MANY AWESOME PEOPLE! VENDORS AND SHOPPERS WERE VERY HAPPY. We captured a few pictures during the show and thought we would share them with you. Today's Country Store of Sumner, WA. Their booth was ever changing, cuz they were selling stuff so fast. (FYI - Sumner has its annual sidewalk sale coming up this weekend). This show had something for everyone, including this darling little guy. 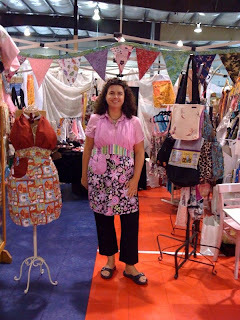 Stacy Tate of Tate's Totes had gorgeous aprons and bags for sale. Jill Radley aka Rose Petal Betty, having some fun with her mom. "Look Mommy, this would look so cool on my bed. Can I have it?" Katy of The Classic Farmhouse. She did a fabulous job. 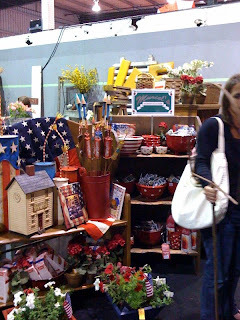 Her booth was located next to The Great Harvest Bread Company, she smelled that wonderful fresh baked bread aroma all day long. Just thinking about that makes us gain weight! Luluz fun jewelry display. She had an old double wash tub with glass on top in her booth, we thought it would make a terrific kitchen island. 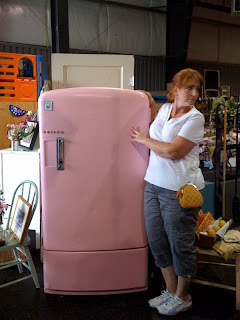 Look who bought our Funky Junk Sisters Retro Pink Fridge! This spunky chick teaches art classes and is going to store her art supplies in it! Fabulous!! 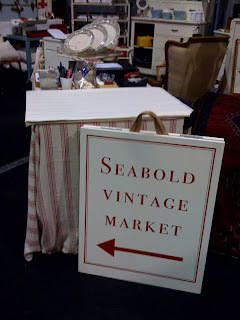 Liz of Seabold Vintage Market was so sweet to allow us to use her beautiful 1951 red truck in the front entrance of the show. Many snapshots were taken with it! 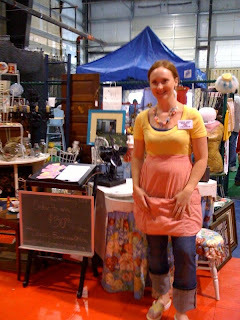 Patricia of Tippy Stockton had a darling booth with a fresh tangerine and aqua color scheme. We heard lots of OOOHS & AAWHS coming from this area. 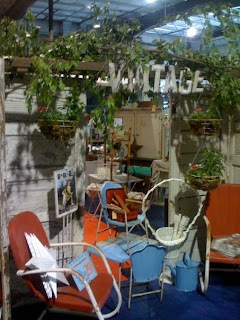 Folkart Gatherings is another great shop in Sumner, WA. They specialize in primitive design. Robins Egg Blue has such a simple yet elegant style. 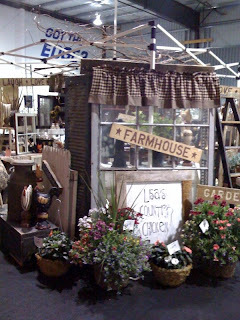 Lisa of The Country Chicken has Farmhouse Funk down to a T. Just had to have one of her big flower pots on our back porch! 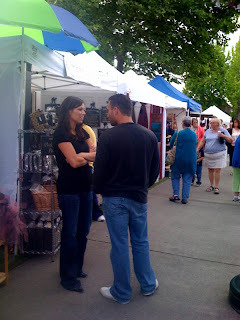 You can find her at the downtown Puyallup Farmers Market! Hope you enjoyed all of the pictures, make sure you check back often to see when our next show is. Bloggers will be talkin about this for days so we will try to link to all of the other sites out there that have posted more about the show. If you know of one, please comment below to tell us about it. Stay in touch! 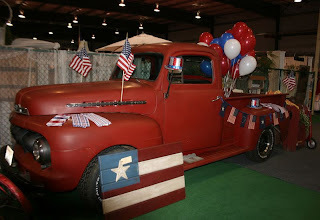 We'll be fillin you in on all of our junkin adventures! WOW!!! What a turn out! We had a line waiting at the door! So festive, we all had a great time and a great day meeting new friends and catching up with old ones. We are so happy to finally meet some of you bloggers in person. 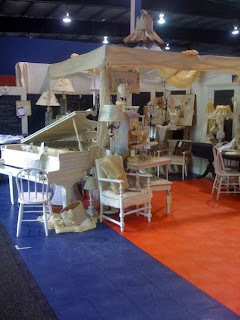 Each booth was absolutely fabulous, including Retreat Design. 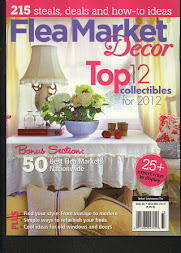 They always have wonderful themes and fantastic products. Junk, junk and more beautiful junk from JohnBobCoolJunk! A view from above. We couldn't fit but a small section in the camera, but you get the idea, the crowds were happy to sift through all the treasures! We will be back at it again today, so load up the family, friends, animals, etc and come on over. Don't miss out, we won't be back at it again til next year (our feet couldn't take it)! It's here! It's here! Hope to see you all there! 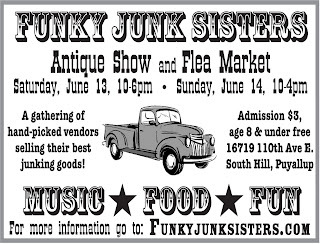 Today was set up day for The Funky Junk Sisters Show. It was a day full of work but we had a blast! So many wonderful creative people out there. The booths are totally over the top!! 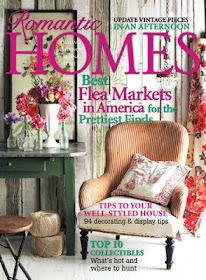 You'll find lots of goodies, from Shabby Chic to Farmhouse Funk. The vendors are all so wonderful, so full of creativity, believe us when we tell you that you DO NOT want to MISS this event. 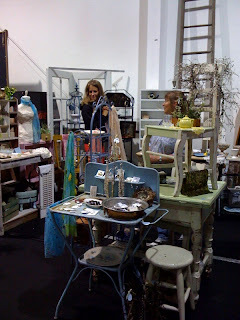 We had such a hard time concentrating on the set up of our booth, cuz all we wanted to do was shop all the other vendors! Seriously!! Here is the schedule for tomorrow, doors open at 10 am (ladies your gonna wanna be there early) doors close at 6pm. The Zumba Maniacs will do a demo at 10:30. 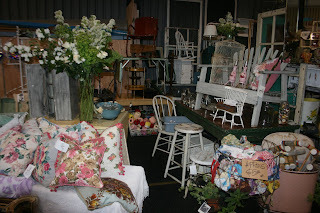 Kris and Amy of Today's Country Store will be available to answer your decorating questions from 12 to 1pm and Trisha Haywood will perform live on the stage from 1 to 3pm. It will be a full day of fun, make plans to eat here too cuz we are gonna have some good grub!! Sunday the hours are from 10 to 4 and we'll have live music again by SUMMER! Make sure you stop by our booth to pick up a souvenir and to say Howdy!! 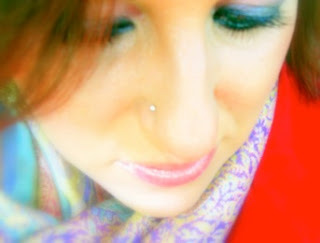 Trisha's music has been defined as bold, real, honest, vulnerable, straight from the heart. 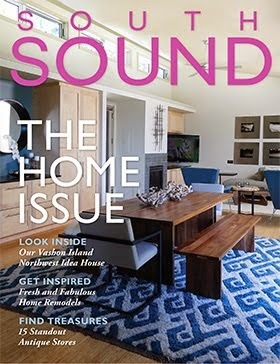 With a new & unique sound that many have said soothes their soul! See her live at The Funky Junk Sisters Show this Saturday at 1pm. Honk if you see this driving down the road!!!! Well Dixie has been working hard on it's transformation for our show this weekend. I haven't seen it yet, but she tells me that she has been painting it outside in her driveway and people keep slowing down when they drive by to check it out! Someone even honked at her! I can't wait to see how the PHILCO turns out. 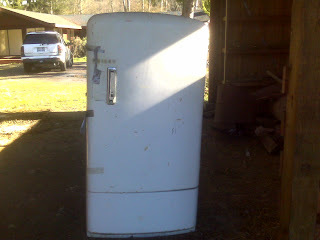 Dixie has posted more before pictures on her blog, make sure you head over there to take a peek! We are looking forward to meeting all of you this weekend! We had so much fun yesterday at The Farm Chicks! As we walked in the doors we were provided with this wonderful photo opp! A darling banner made out of hankies. Unique planter. We would have taken this home with us if we could've, but our car was already loaded with tons of stuff! One of our favorite booths, filled to the brim with goodies. Funky Junk Sister #1 (MOM) loved this creative way to use an old spreader. As always, beautiful things from Retreat Design. They are the masters of display. Aprons, aprons and more aprons! Ormolulu sure knows how to do it. There was so much more, but the batteries in my camera gave out! 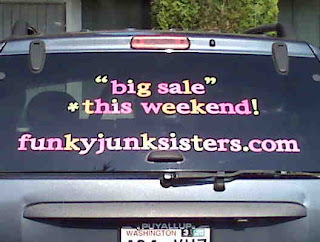 If you like what you see here..... you must come to The Funky Junk Sisters Show this weekend in Puyallup, WA! Join all the junkin sisters on our hunt for hidden treasure. 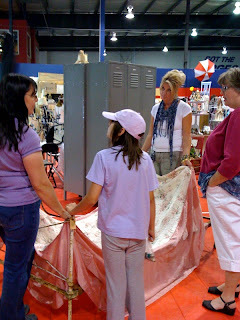 Remember.... the gals of Today's Country Store will be available to answer your decorating questions on Saturday in their booth. Make plans today! Get Your Fix of Funky Junk!